When fashion designer Tom Ford first announced his foray into making motion pictures, beginning with 2009’s A Single Man, some people scoffed at the idea of someone with little to no experience in movie-making suddenly asking audiences to trust his storytelling capabilities. But, if the rise of Trump has proven anything, it’s to never underestimate the power of the underdogs (even if they are as morally reprehensible as Trump), and not only did Ford land some serious critical praise for his debut feature, but it also garnered some awards attention for lead actor Colin Firth. It seemed that Ford had carte blanche to do whatever he wanted as his follow-up film, but instead he chose to wait seven years to make another movie, and what ended up being the film he made – Nocturnal Animals, based on the 1993 novel Tony and Susan by Austin Wright – will definitely have been worth the wait for Ford’s biggest fans, but for others might come across as something a little colder and toxic than they’d be expecting from a fashion designer. As it is in Wright’s novel, the film focuses on a woman named Susan (Amy Adams), an art gallery owner who is left unfulfilled by her job, her luxurious LA pad, and her philandering husband (Armie Hammer). One day, she receives a package from Edward (Jake Gyllenhaal), her first husband whom she left under bitter circumstances, and inside is a manuscript for his debut novel “Nocturnal Animals”, which he has dedicated to her. As she reads it, we see the story play out on-screen, which turns out to be a pulpy revenge novel where a man named Tony (also Gyllenhaal) seeks retribution for the psychotic men who raped and murdered his wife and daughter. Susan starts to recognise the parallels within the story and the real-life breakdown of her first marriage, and it leads her to reflect on that troubled relationship and the events that led to their separation. As sophomore movies go, Ford’s is at the very least a decently-made one. 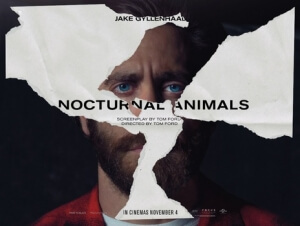 Nocturnal Animals contains the recognisable elements from his previous film A Single Man, including tight close-ups of actors’ facial features and provocative arthouse imagery all set to a score by composer Abel Korzeniowski, all things that Ford is keen to exploit as much as possible to make it a visually intriguing film to look at (bar an opening credits sequence, which is of several obese women dancing around as part of a gallery exhibit, and sets the mood for what turns out to be a similarly grotesque pill to swallow). For the most part, he and cinematographer Seamus McGarvey are onto something, and the results are undeniably effective with many of the visuals hard to get out of your head long after watching it. As ever, the acting is very solid as well with Adams and Gyllenhaal both on top form, while Michael Shannon is also a hoot to watch as the in-story police detective who helps Tony out with his revenge. Look out for scene-stealing cameos from Laura Linney, Michael Sheen, Isla Fisher and Jena Malone among others who all make the most of their limited screen time. It is a very good-looking movie, but like a good number of the models that wear Ford’s designs at fashion shows, it is also a rather vapid and empty one. The film just doesn’t really have anything to say from a substantial point of view, and what substance there is within its body is mostly designed to shock and intensify the audience rather than actually make them think. You’re not entirely interested in the lives of its characters, who are intentionally designed to be unsympathetic but are still not as engaging or fascinating as Ford probably thinks they are, and the story tends to meander as it slowly makes its way to the next big plot point, with one extended early sequence in the story-within-a-story going on for a little too long for it to become rather self-indulgent. It leaves you with a very cold and bitter feeling as you’re walking out of the auditorium, which was almost certainly Ford’s intention given the rough nature of the story, but it’s the kind of coldness where you have no idea what you’re meant to be feeling, or whether or not you even liked it all that much. Personally, I don’t feel that this was as strong or as gripping as it could have been, and while there’s no doubting Ford’s apt understanding of how to make a decently-made film, Nocturnal Animals just goes a little too far with its pretentions and ends up leaving a lot of people feeling as empty and hollow as one of Ford’s many models. Nocturnal Animals is undeniably well-made, with provocative arthouse imagery and strong performances, but it can’t help looking rather cold and empty at its centre, with almost nothing to say and no real attachment to what is happening or who it’s happening to.